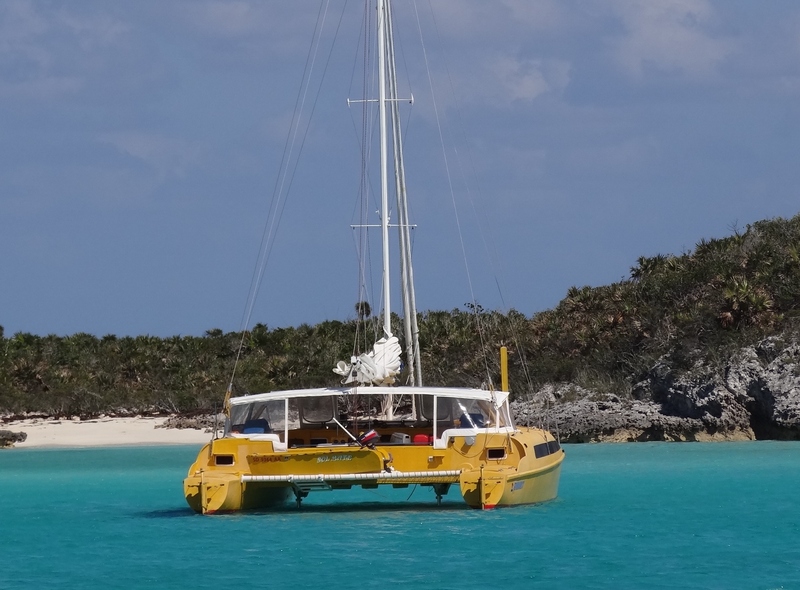 Cat Island, home of The Hermitage, was our next planned stop, followed by Little San Salvador and Eleuthera. Oh, but the weather had other ideas for us. Friday promised to be another great sailing day and as it turned out, good thing for that. Cat Island sits approx 30nm NNW of Conception; we left at 7:30 figuring we might be able to go ashore later that afternoon. As we’ve all experienced, the best laid plans often never come to fruition. About 10 miles away from land we got cell service, none obviously available on Conception. The approaching front was looking to have strong SW winds, clocking W, then NW; more of an event than we cared to sit out in Cat’s New Bight with no west protection. Herr Otto Pilot was immediately given a 20 degree course change while the worried crew studied the chart to determine where to run and hide. And run we did; the course change improved our angle to the wind and we sped along over 8kts, the ever-increasing waves at our stern not bothering us any. 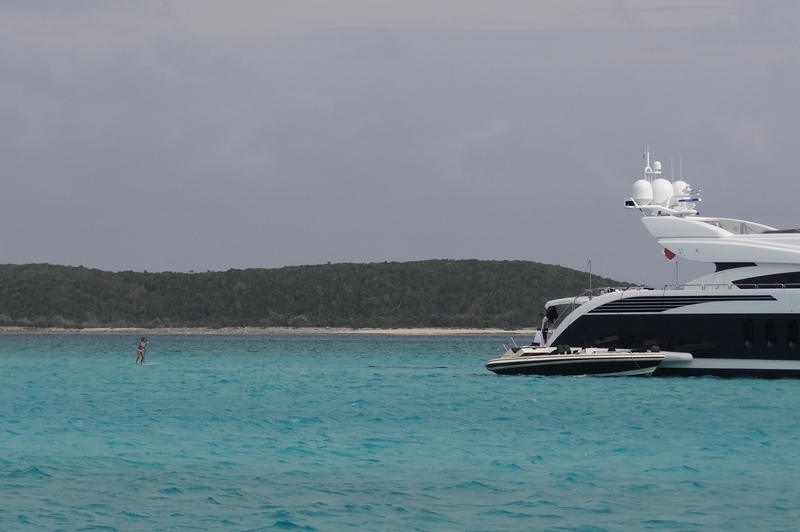 Other than trying to get a slip at Hawk’s Nest Marina on Cat Island our only other option was to get over to the Exuma chain, go in a safe cut and find a protected spot. We heard another boat going into Hawk’s Nest but we nixed that figuring not many marinas have much space for cats and did we want to blow the dockage budget anyway? Our excellent heading would take us to the excellent Little Farmer’s Cut; perfect. Anchored by 5:30, a 70nm day behind us, and the next day we’d head 30nm north to try for a mooring at Cambridge Cay (in the ECLSP) with a backup anchoring spot behind Bell Island. Luckily we had that backup spot because all 14 balls were full. We did not see a single boat underway the entire 30nm trip (5hrs). We were the last boat in behind Bell Island; two monos, one trawler and one yacht before us, but we snagged a perfect spot close in. Gotta love being a cat. The anchor held right off; always a huge plus with big wind coming. For once the front arrived in daylight, although just barely. 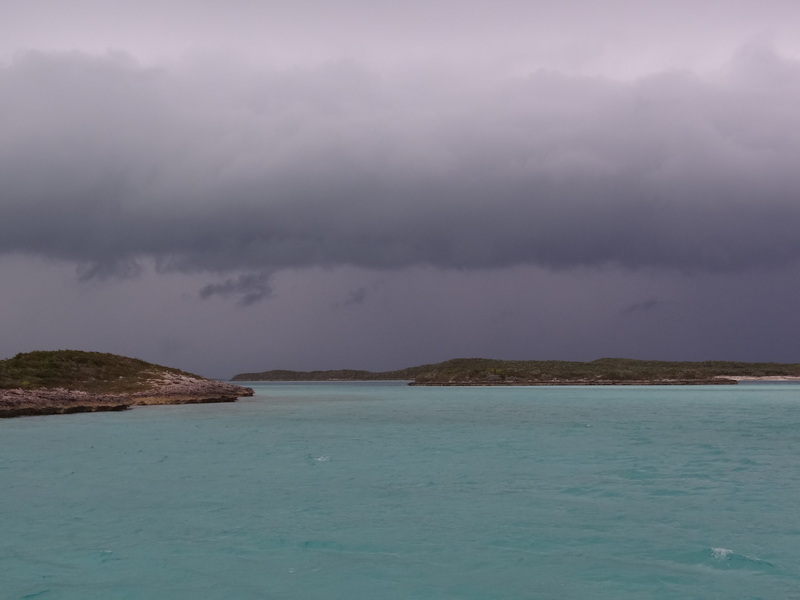 Here’s the sequence of events beginning around 1pm: Russ checks anchor using kayak, wind picks up, fellow cruiser provides Chris Parker WX update, took showers, watched front approach around 5:30 and rain begins 5:45. The wind topped out at 30kts but mostly we saw 18-22kts although it felt like less. The wind shifted from SW to W, finally settling in for the night at NW. We set out our bucket to catch rainwater. Really felt quite safe and our only worry was hoping that the wind did not shift to N or NE to soon as we’d lose all our protection when it did; then time to go. Decided this might be a good time to test out ActiveCaptain’s Drag Queen alarm. It worked well during testing and I’m happy to say that the alarm did not sound in the real overnight test. One of my biggest fears is dragging during a windy dark night. Bad enough if your anchor pulls out but imagine if the shackle broke and you became separated from your best friend? Now you’ve got to get things under control (hope you haven’t hit anything behind you) and launch your backup anchor; which we have sitting ready to go at the bow. Not every boat does. Sunday was a post frontal cloudy, cool day and we kept busy with baking muffins, washing clothes in a bucket and discussing where to move to once the wind shifted north. Considerable discussion also ensued because in very windy conditions I am at the bow while Russ takes the helm. This infrequent role reversal requires establishing good hand signals as well as a backup plan should I have poor job performance. Fortunately we had this: PPPPPP- the 6Ps. Leave a comment if you business folks know what all those Ps stand for. 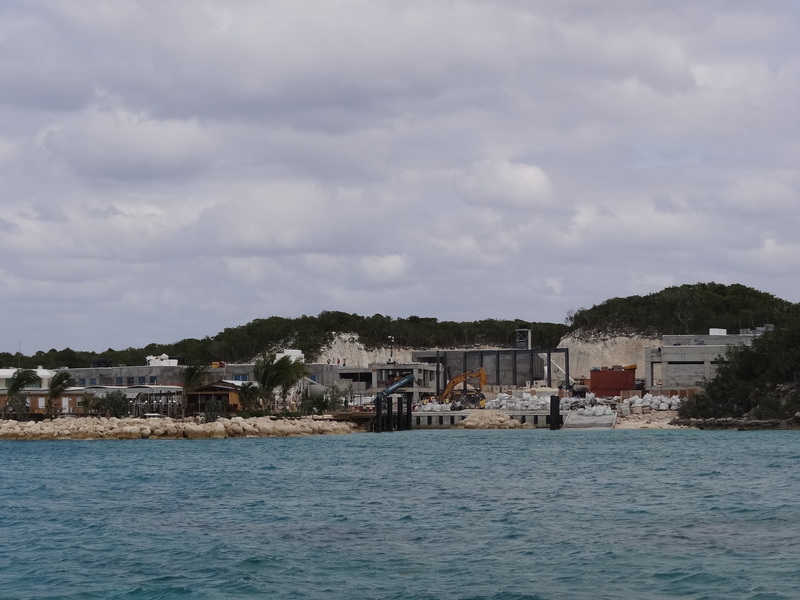 The one possible spot to re-anchor in was on the other side of Bell, which was now in the lee, but a major project was underway so we passed that by and headed down toward a spot on the south end of Pipe Cay. Monday after breakfast we moved again for even better protection from ENE winds which had calmed down to a tolerable 14-19kts. Ran the watermaker using solar power thanks to a mostly sunny day- which also was a good day for more bucket laundry (we had to skip BlackPoint so I was WAY overdue for a washing machine). We ended up with a bright yellow neighbor; note the similar cockpit enclosure. This entry was posted in Uncategorized and tagged ActiveCaptain, anchor. Bookmark the permalink. In the military there is a seventh P.
I didn’t know the military had one too; wonder which came first? proper prior planning prevents *insert what you said here* poor performance. Darn good! too close in fact, so that while you think this is a good thing, it is not. Means you still are too tied to your former working-selves life and my recommendation for a cure is: KEEP CRUISING ! I learned it as Proper Planning Prevents Piss Poor Performance.